The visualization of a key point in the second book in my Sirens series. Ancient evolutions hold great sway over the more recently evolved, especially with so many species facing the looming threat of extinction in a dying ocean. This ancient does not. This is the Coelacanth, also known as "The Living Fossil" and is the original ancestor of all animal life on Dryland ... including humans. It thrived during the Devonian period, some 400 million years ago. As part of the family known as Lobe Finned fish, it's traitorous ancestors were the first Orphans to shun the embrace of Mother Ocean and dwell on land. This is where all the trouble started. In a bizarre twist that perhaps proves it's importance in the history of evolution, colonies of Coelacanth exist to this day. Writing has long been a integral part of Mark Heine's creative process. In the pursuit of his original artistic voice, Mark's writing has evolved to become the driving force behind his work and has led him to envision a world of his own creation. Sirens, the culmination of 35 years exploration, is inspired by the sea-nymphs, made famous in Homer's Odyssey. 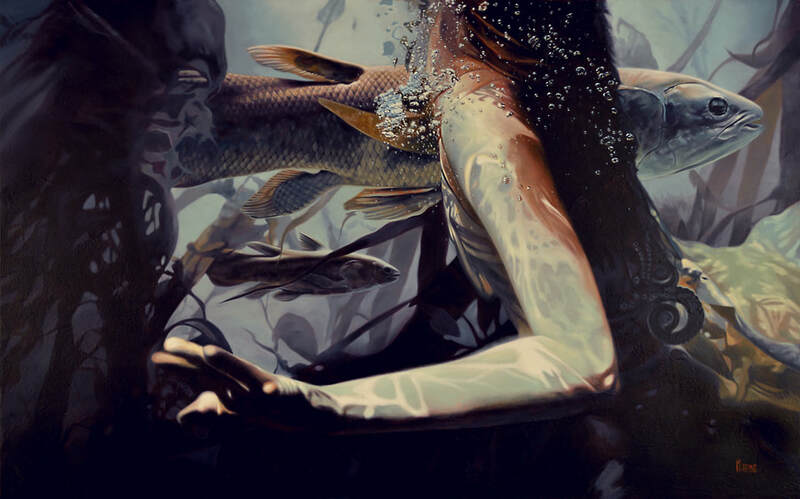 These underwater visions of mythological muse are rooted in the moments of an ongoing and developing fictional narrative. This complex narrative, involving human evolution and our natural environment, is the unifying conceptual thread that ties these surreal visions.